(Phys.org) —The Georgia Tech Research Institute's software-defined, electronically-reconfigurable Agile Aperture Antenna (A3) has now been tested on the land, sea and air. Department of Defense representatives were in attendance during a recent event where two of the low-power devices, which can change beam directions in a thousandth of a second, were demonstrated in an aircraft during flight tests held in Virginia during February 2014. One device, looking up, maintained a satellite data connection as the aircraft changed headings, banked and rolled, while the other antenna looked down to track electromagnetic emitters on the ground. "We were able to sustain communication with the commercial satellite in flight as the aircraft changed headings dramatically," explained Matthew Habib, a GTRI research engineer. "The antenna was changing beam directions to compensate for the aircraft headings. At the same time, we were maintaining communication with a device on the ground." In addition to rapidly altering its beam direction, the antenna's frequency and polarization can also be changed by switching active components. The prototype used in this test operates from 500 to 3000 MHz with a plus or minus 60-degree hemispherical view. The latest prototypes have been able to provide gain to 6 GHz, opening more communication options to the end user. For the flight test, GTRI collaborated with SR Technologies, Inc. (SRT), a Florida company specializing in wireless engineering products. SRT provides mobile communications hardware including L-Band mobile satellite, 802.11 (WiFi), and cellular solutions. For this effort, the A3 was matched with an SRT software defined radio focused on the L-Band mobile satellite frequency range. 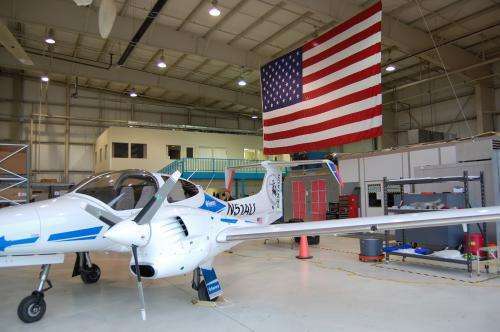 GTRI also collaborated with Aurora Flight Sciences to fly the antennas on their Centaur optionally piloted aircraft. 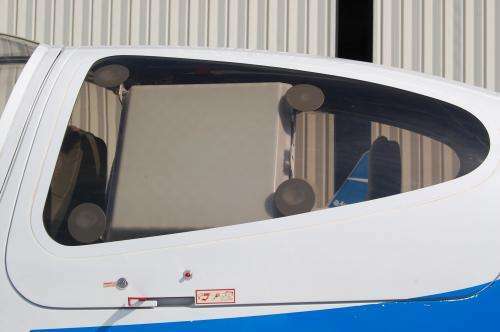 Beyond its ability to be easily reconfigured, the low power consumption and flat form make the Agile Aperture Antenna ideal for aircraft such as UAVs that have small power supplies and limited surface area for integrating antennas. "If you have a large ship or aircraft with lots of power, you can afford to use a phased-array or other type of steerable antenna," noted Habib. "But when you are using small vehicles, especially robotic aircraft and self-sustaining vehicles that don't include an operator, our antenna is a great solution." Composed of printed circuit boards, the antenna components weigh just two or three pounds. "It's not just about the low power and weight," said James Strates, also a GTRI research engineer. "The simplicity of the system, the low fabrication cost and the ability to retrofit the A3 to an existing system also make it attractive to operators." Beyond use on aircraft, ships and ground vehicles, the antenna concept could also find application in mobile devices, where the dynamic tunability could help cut through congestion on cellular networks, noted Ryan Westafer, a GTRI research engineer. "A small electronically tunable antenna could provide a lot of new opportunities for mobile devices," he said. As configured for the flight tests, the upward-looking A3 antenna had a beam 30 degrees wide that could be shifted up to 60 degrees in either direction to maintain contact with the satellite. For the downward-looking antenna, the beam was automatically adjusted to "stare" at a point on the ground, reducing the interference from nearby emitters, Westafer explained. Because it doesn't require mechanically moving a metal dish, the A3 can change beam direction 120 degrees in a thousandth of a second, which gives it a significant response time advantage over gimbaled antennas. The A3's weight and complexity are also much less than for a phased-array antenna with similar capabilities. The A3 antenna uses just one static feed point, while a phased-array must feed and control each element separately. Because of its low power consumption, the A3 requires no cooling system. The Agile Aperture Antenna has also been tested on a Wave Glider autonomous ocean vehicle. Together with previous testing on a moving ground vehicle, the new evaluations demonstrate the operational flexibility of the antenna, Habib said. So far, the A3 has operated successfully at temperatures as low as 10 degrees below zero Fahrenheit, and as high as 100 degrees Fahrenheit. To track the satellite, the antenna uses an inertial measurement unit to provide information about the aircraft's pitch, roll and yaw – as well as its longitude, latitude and altitude. That information is sent to a controller that turns elements off and on to the change the beam direction to maintain communication. Before takeoff, the researchers had programmed into the device the location of the commercial satellite with which it was communicating. The challenge ahead is to take advantage of the antenna's unique capabilities – and to affect the way operators place antennas onto ground, air and sea vehicles. 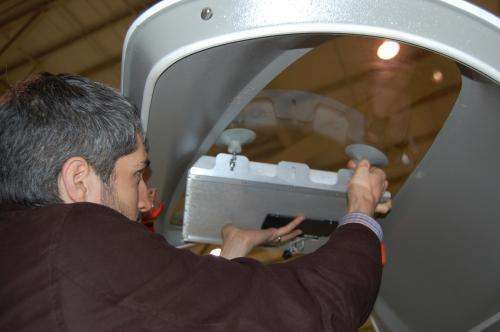 "This is changing the way that we think about integrating antennas onto systems to provide new solutions," Habib said. "Users have not had these capabilities before, and we are excited to see how our partners will be able to take full advantage of this antenna."